High Reps or Low Reps: What get results? If you are a regular at the gym (one such is Fit O’ Clock – best gym and fitness center in Raja Park, Jaipur), you must have noticed the contrast between how men and women lift weight differently. While you may find guys lifting a ton of weights for a few reps in the effort to increase muscle strength, women on the other hand curls 5-pound dumbbells for around 25 reps to tone their arms. Most gym & fitness centers make us believe that high reps lead to fat loss and low reps to strength. 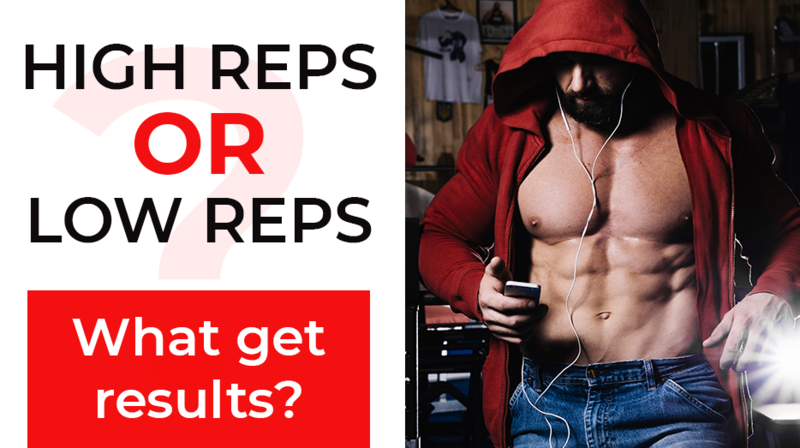 Let’s help you upgrade your knowledge on reps and loads today! Fit O’ Clock, the best health club in Jaipur focuses on repetitions (reps) and sets as the foundation of the majority of its strength training programs. Reps represent how many times (quantity in number) you complete a movement. 1 to about 6 such movements is counted as low reps.
8 to 12 such movements are counted as mid-range reps.
More than 14 such movements are counted as high range reps.
Sets, on the other hands, stand for how many times you have completed a rep scheme. So, if your trainer prescribes 3 x 5, it means he is looking for sets of 5 reps, i.e., you need to complete the exercise 15 times but taking mini breaks between each set of 5. How heavy is ideal for your body? Here’s something you need to know. Each rep scheme that you complete will have a different effect on your muscles. In case of low reps, you will start to wear out toward the end. In higher rep, though you may not fail, you will feel fatigued. The rule of thumb is to choose a weight that challenges your body. But it does not mean you have to exhaust yourself for that matter completely. Here’s something most of us have been getting wrong! We believe that the amount of weight used during a workout or the number of reps we do helps us lose weight. But no, that’s not true. It is instead all about the intensity of the exercises we commit to. Take less rest between exercises to burn more calories and increase metabolism. While some researches back the popular belief that reps under 15 are good for muscle building, some others believe that both light and high reps can be equally effective. And no! A heavier weight does not automatically build muscles. Your diet plays an important role, plus the intensity of the workout. Related: Cardio or MRT: Which workout burns more fat? Verdict: Should you go light or go heavy? So which is the ideal strength training program for your body? Trainers at the best gym in Jaipur – Fit O’ Clock has a tip for beginners. Start with low weight high reps or moderate weight moderate reps! So, to go light or to go heavy is totally your call. Because at the end of the day, both build muscles and give the toned appearance. Wonderful work! This is the type of information that should be shared around the web. Gajendra, thanks for the article post.Really thank you! Great.